Chang's Beach, AKA Poolenalena beach, lies on the edge of Wailea at the start of Makena. 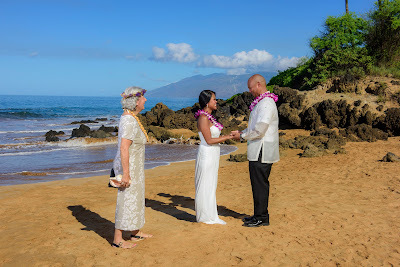 This wide swath of white sandy beach provides a beautiful backdrop for our Maui wedding couples and a great location for swimming, body boarding or just checking out the ubiquitous green sea turtles. 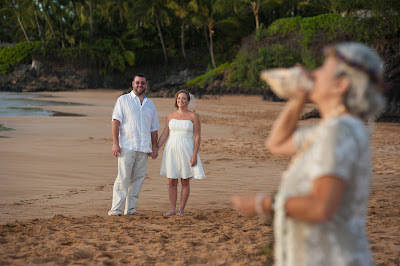 Mornings here are crisp, the sand is still cool but the sun will rise quickly and even in the winter it can be quite warm here so we try to start our Morning Maui Beach Weddings early! There are no Hotels on Poolenalena beach so there's usually plenty of room for us to find some privacy for our clients. 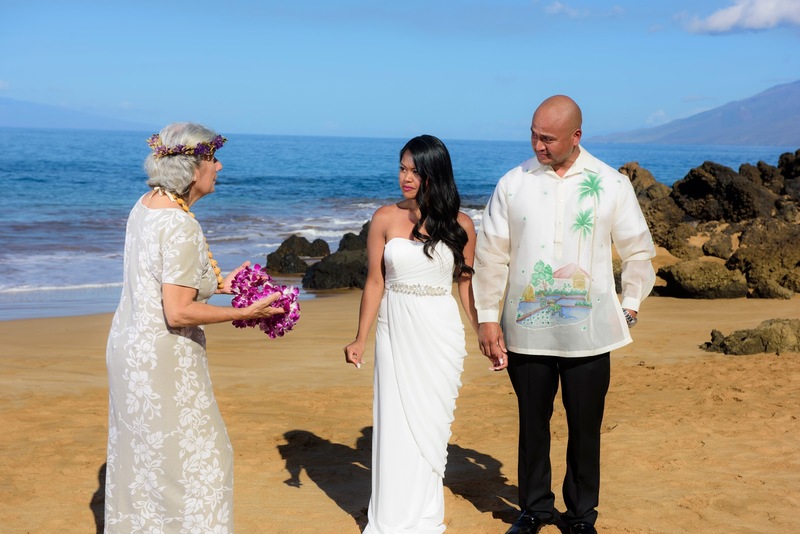 If it is crowded, we can just walk the path to the north and try our luck at "Secrets" or Paipu beach, another long white sandy beach with spectacular scenery, lava rock outcroppings and coconut palm trees. Rosiel and Charles booked our Morning Special Wedding package for their ceremony at Poolenalena a few weeks ago. 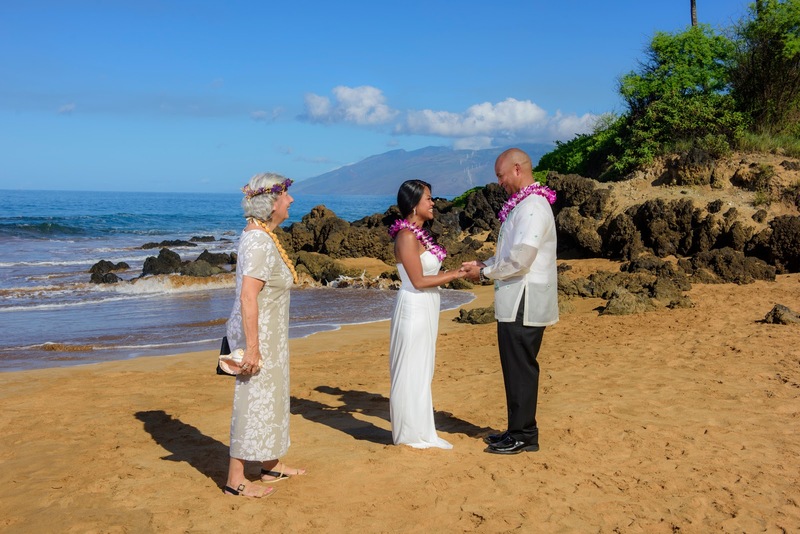 Their love and dedication for each other was obvious and we were honored to be privileged to host and photograph their nuptials. 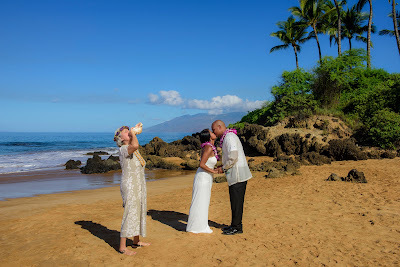 A small group of family was present, as is typical with Maui destination weddings. 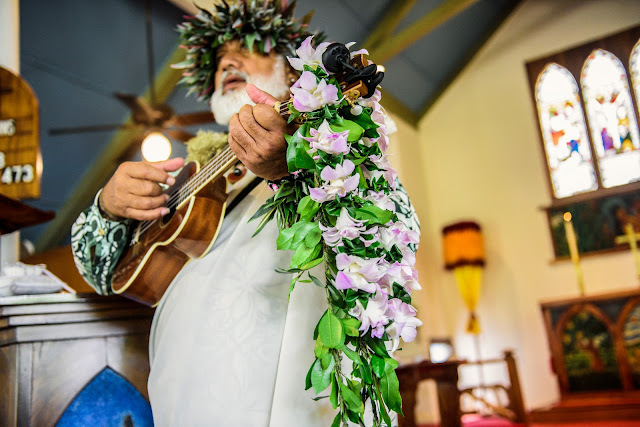 There are thousands of elopements here every year and usually the couple comes by themselves or with a few close friends and family members. A Maui destination wedding is the perfect excuse to combine your wedding and honeymoon, especially if you don't want to bust your budget with a huge wedding back home. 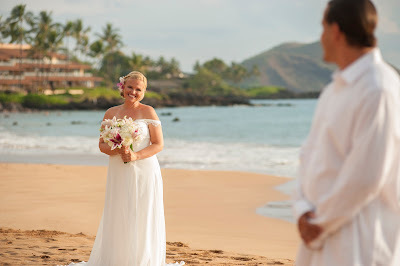 Finding a reputable Maui wedding planner isn't hard (just click on that link). Just give them a call and they will do the rest! So thanks Rosie and Charles, it was a pleasure working with you and your wonderful family!